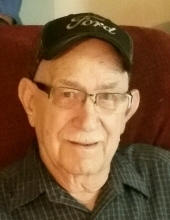 Raymond Meldrem, age 87 of Grinnell, died one week prior to his 88th birthday on Tuesday, March 19, 2019 at his home in Grinnell surrounded by his family. A funeral service with military honors will be held at 10:30 a.m. on Tuesday, March 26th at the Smith Funeral Home in Grinnell with Rev. John Epperson officiating. Interment will be at Hazelwood Cemetery in Grinnell. A reception will follow at the Eagles in Grinnell. Visitation will begin at 2:00 p.m. on Monday at the Smith Funeral Home and the family will receive friends from 4:00 p.m. until 7:00 p.m.
Memorials may be designated to Grinnell Regional Hospice, mailed in care of the Smith Funeral Home, PO Box 368, Grinnell, Iowa 50112. Memories and condolences may be shared with the family online at www.smithfh.com. Raymond was born the son of Cecil and Maude (Wolferd) Meldrem on March 25, 1931 in Grinnell, Iowa. He was raised and educated in Grinnell. Raymond was united in marriage to Donna Josephine Van Draska on September 6, 1952 in Grinnell. The couple lived in Grinnell all of their lives and Ray was a longtime employee of 38 years at Donaldson’s in Grinnell. He was a talented wood worker. He enjoyed spending time with family and friends and love his Indianapolis Colts. In his younger years, he enjoyed hanging out with his buddies at Duffy’s Tavern in Grinnell and in his later years he enjoyed having coffee with his friends at Hy-Vee and Maid-Rite. His other enjoyments were watching westerns, Jeopardy, and Wheel of Fortune with his dog, Buddy. Raymond is survived by his children, Steve Meldrem of Grinnell, Debra (Mike) Dvorak of Ruidoso, New Mexico, Lonnie Meldrem of Grinnell, and Wade Meldrem of Grinnell; 7 grandchildren; and 11 great grandchildren. He was preceded in death by his parents; wife, Donna Meldrem; and siblings, Glenn, Ruth, Lois, Gladys, Max, and Shirley, who died at the age of 8 from Leukemia. To send flowers or a remembrance gift to the family of Raymond Meldrem, please visit our Tribute Store. Family will receive friends from 4:00 p.m. until 7:00 p.m.
"Email Address" would like to share the life celebration of Raymond Meldrem. Click on the "link" to go to share a favorite memory or leave a condolence message for the family.